Many directors turned to film comedy to criticize the transformation of ideals, the renouncement of one's self for the sake of a quiet life or for getting ahead. In 1955, Sordi had been the symbol of this negative figure, interested cynically and exclusively in living comfortably under all skies and regimes, in L'ARTE DI ARRANGIARSI (THE ART OF GETTING ALONG), the last film Vitaliano Brancati conceived and wrote for director Luigi Zampa. Sasa Scimoni is a social and political climber, alternately friend and enemy - the setting is Sicily - of the Socialists in the immediate post-war period, then a Fascist, then a Communist, finally a Christian Democrat, a hoarder of riches thanks to swindles and frauds for which, however, he ends his career in prison. A savage moral fable about the dishonesty and corruption of people near the centers of power, it represented one of Zampa's finest films of civil satire. The reserve of such a figure, the one ready to camouflage himself so as not to displease the powerful, is to be found in Luigi Comencini's film IL COMMISSARIO (THE POLICE INSPECTOR: 1962), written by Age and Scarpelli. The young police inspector Lombardozzi, interpreted by a Sordi impressively restrained in the comic episodes and given up exclusively to irony, conducts an investigation that brings to light certain private "affairs" concerning a well-known political figure that it would be prudent to keep a secret. Faced with the possibility that, in order to provide a version of the facts favorable to his superiors, an innocent person would spend years in prison, Lombardozzi, ignoring pressures and threats, has him released and finishes off the investigation in his own fashion, but is forced to leave the police. Another aspect of the post-war period that appeared in films long before the world-wide success of THE GODFATHER was the mafia. 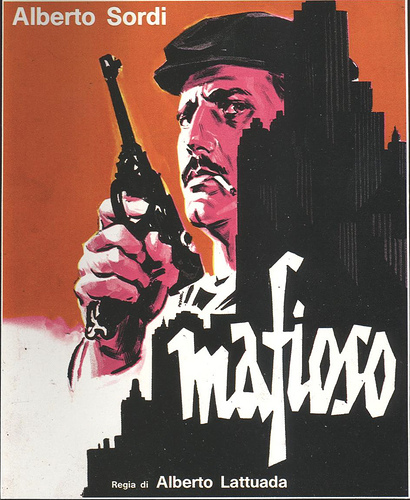 MAFIOSO, directed in 1962 by Alberto Lattuada and written by Age and Scarpelli on the basis of a synopsis by Rafael Azcona and Marco Ferreri, is a pungent grotesque comedy that leads to high drama. Sordi plays the role of a serious and honest Sicilian employee with wife and children who for years has lived and worked in Milan. Upon returning to his home town for a vacation, he is forced by the local Mafia "godfather" to fly secretly to America and murder an underworld "boss" whom only an unknown killer could get near to. So the serious ordinary man becomes a murderer, then flies back to Italy and picks up his former live in Milan as if nothing had happened. Here again we have the uncommon black humor of Azcona and Ferreri, but the story puts its finger, with great precision and determination, on the Mafia plague in Sicily.